Astonishingly Rare Mutated Gold Possum Nicknamed "Real-Life Pikachu"
Pokemon fans rejoice, Pikachu is real! No, we’re not talking about the upcoming live-action Detective Pikachu movie starring Ryan Reynolds. A rare golden possum has been rescued in Melbourne, Australia, and he’s gone viral for his resemblance to the iconic pocket monster. A member of the public discovered the brushtail possum lying on the side of the road. It is estimated to be around five-months-old, and is believed to have fallen off its mother’s back. Its finder took the possum to the local veterinery clinic, where vet Stephen Reinisch realised the animal had a genetic mutation resulting in the golden color of its fur. 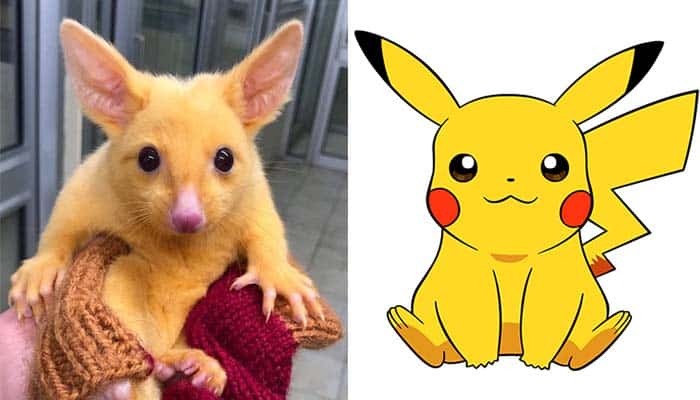 Reinisch says the possum will be handed over to a wildlife carer, as due to its unusual coloring “Pikachu” will be targeted by predators in the wild. Brushtail possums are also highly territorial, making her difficult to release. “If she becomes [a little] more out there and a bit feisty she might be released, but if she stays anxious she will remain in long-term care,” he added.